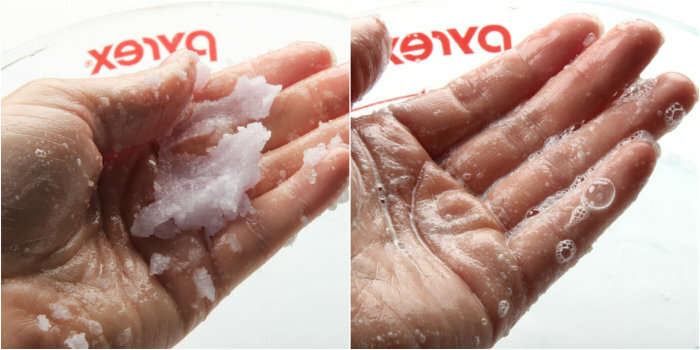 ONE: Chop and melt 11 ounces of Clear Melt and Pour Soap in the microwave using 15-20 second bursts until melted. Once completely melted, add the glycerin and sweet almond oil. Stir the ingredients together. The mixture will become cloudy, and some oils will sit on top. This is normal. TWO: Begin adding drops of the Liquid Violet. 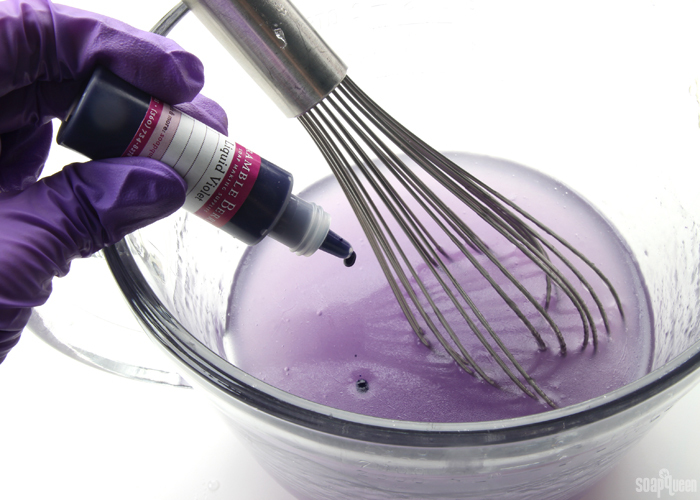 I found that in order to incorporate the colorant into the mixture, I needed to “break apart” the drops with a whisk. 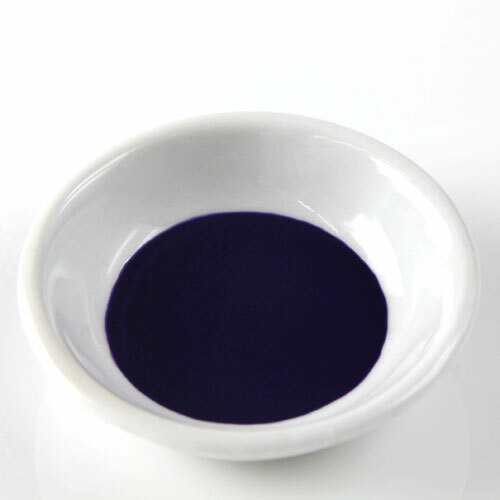 In the photo below, you can see how the colorant is not mixing in. If this happens to you, grab a whisk (preferably metal) and start whisking! The colorant will start to disperse throughout the mixture. 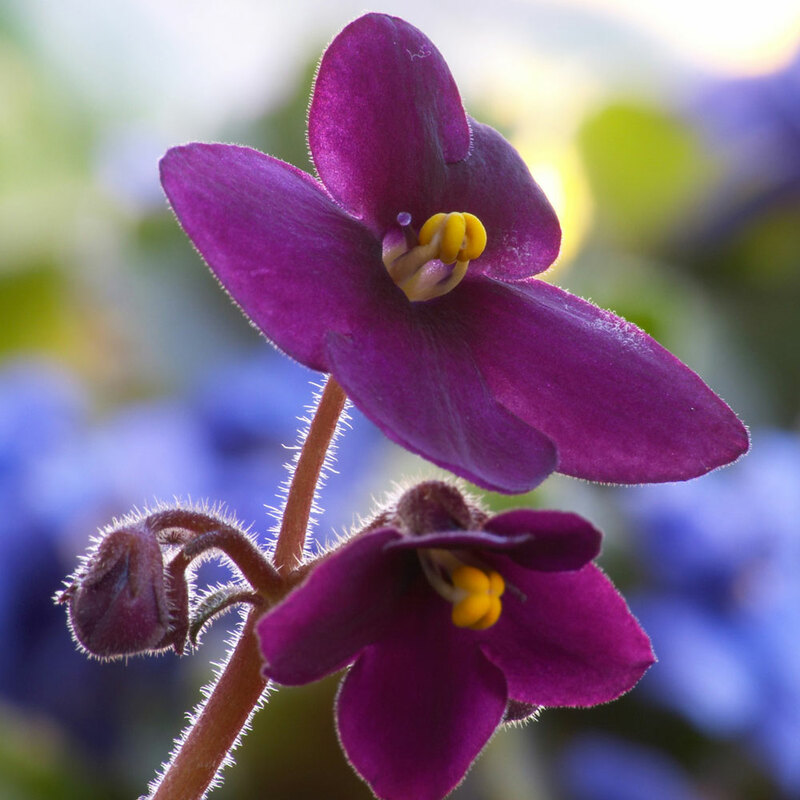 THREE: Continue to add drops of the Liquid Violet until you achieve a rich purple color. I used about 12-15 drops. Keep in mind when the sugar is added, the color will lighten. Add drops until you’re happy with the shade. Use the whisk to completely mix in. 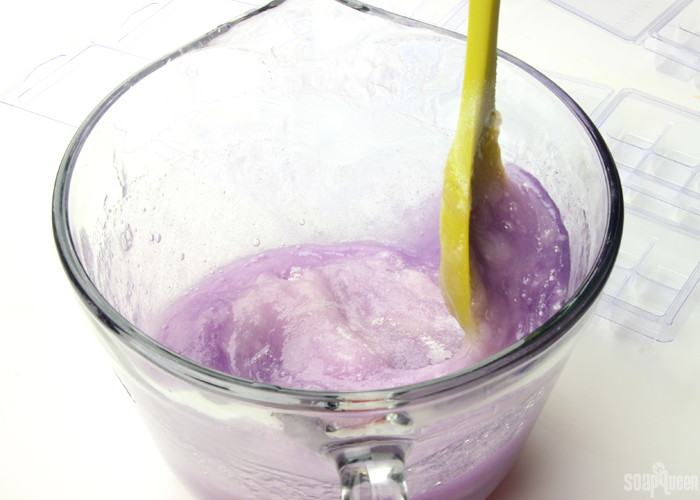 FOUR: Add the Violet Fragrance Oil and use the whisk to mix in thoroughly. At this point, the mixture will have cooled and thickened. Once the sugar is added, the mixture will cool very quickly. To keep the mixture fluid and pourable after the sugar is mixed in, check the temperature of the mixture. Heat in the microwave using 10 second bursts, stirring between each burst, until the mixture is about 135 ° F. Be careful to not burn the mixture. FIVE: Open all the molds and have them ready on the counter. Add the granulated sugar, and use a spatula to quickly stir in. SIX: Pour the mixture into each Small Cubes Mold and Package. Allow them to cool and harden for several hours, up to overnight with the lid open. SEVEN: Once the cubes have fully cooled and hardened, use a knife to cut the cubes at the seam. Or, you can break off a cube once you’re ready to use. To use, wet hands and break apart the cube. Apply to the skin and scrub. 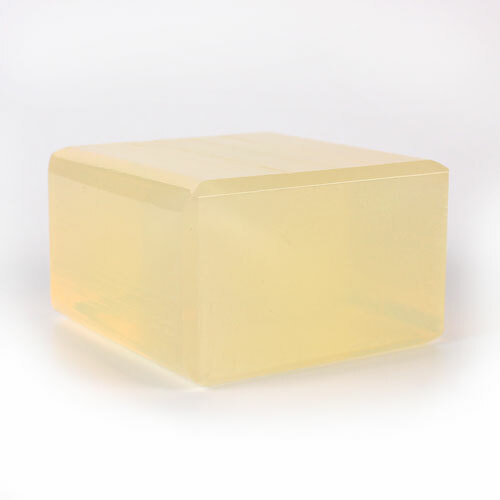 The cube also creates a mild lather from the soap, leaving skin feeling clean yet moisturized. Store the cubes in a dry, cool place. 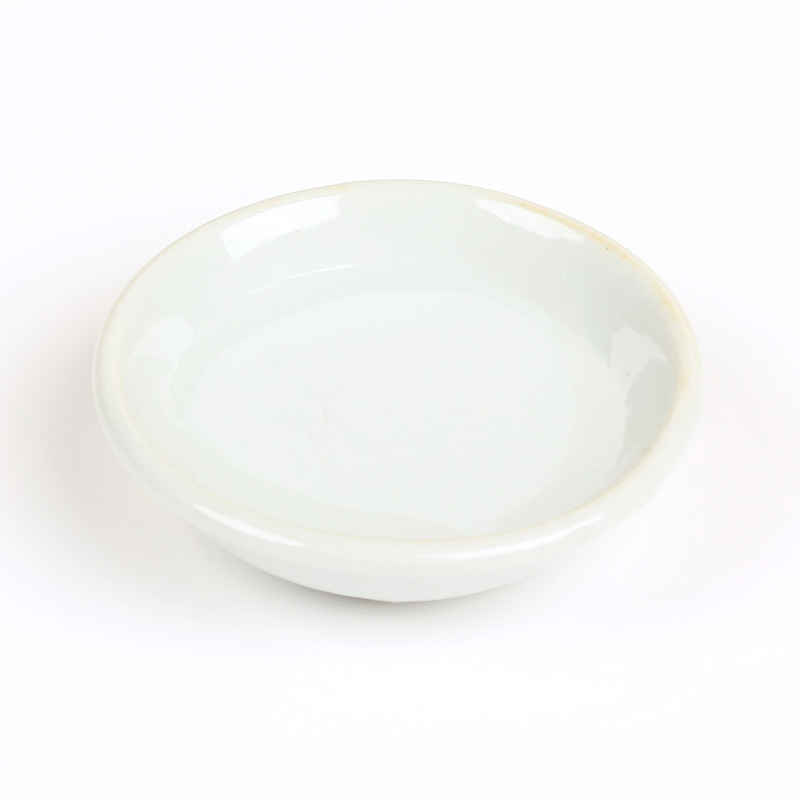 Prevent them from coming in contact with water prior to use. Enjoy! 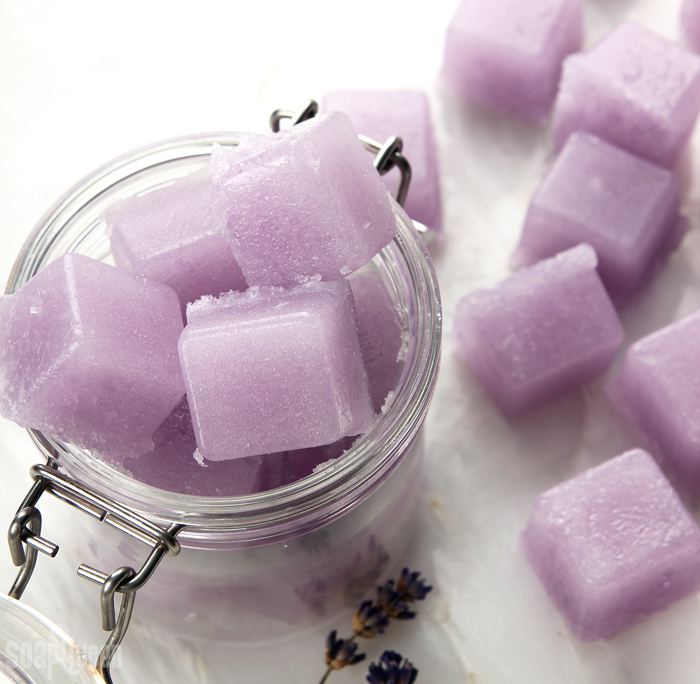 These Violet Sugar Scrub Cubes are made with melt and pour soap, oils and glycerin to create a product that foams yet feels incredibly moisturizing. Chop and melt 11 ounces of Clear Melt and Pour Soap in the microwave using 15-20 second bursts until completely melted. 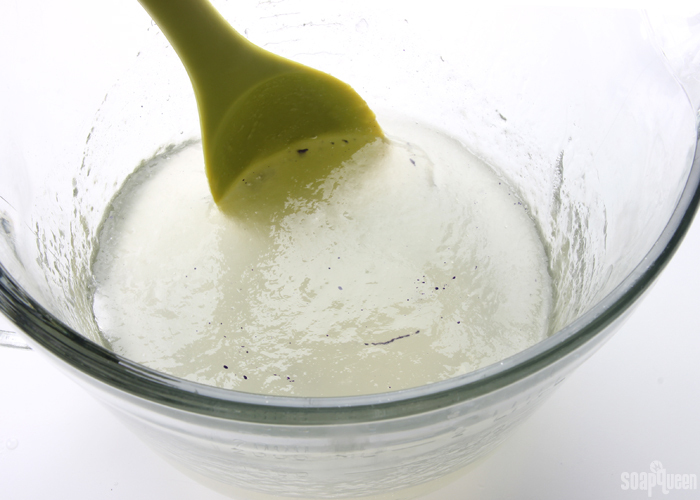 Once completely melted, add the glycerin and sweet almond oil. Stir the ingredients together. The mixture will become cloudy, and oils will sit on top. This is normal. Begin adding drops of the Liquid Violet. 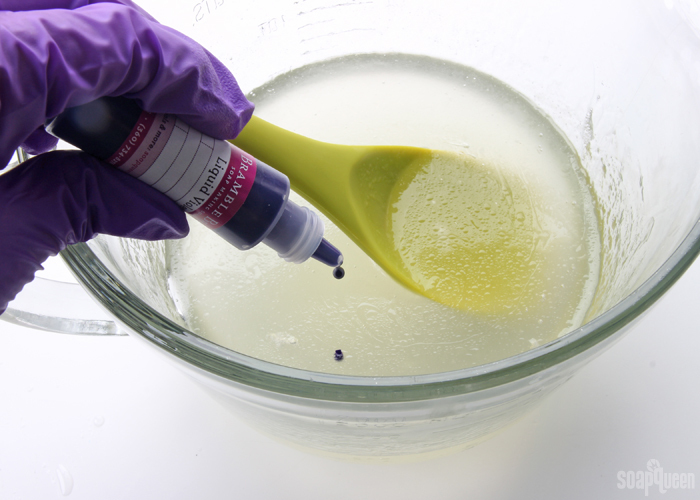 I found that in order to incorporate the colorant into the mixture, I needed to “break apart” the drops with a whisk. 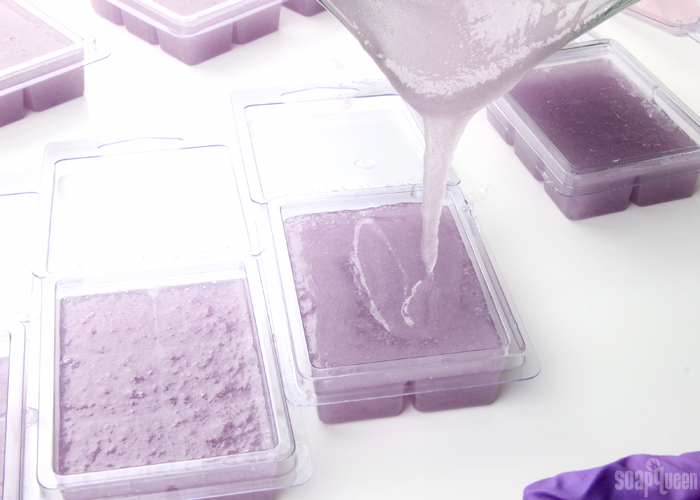 In the photo below, you can see how the colorant is not quite mixing in. If this happens to you, grab a whisk (preferably metal) and start whisking! The colorant will start to disperse throughout the mixture. 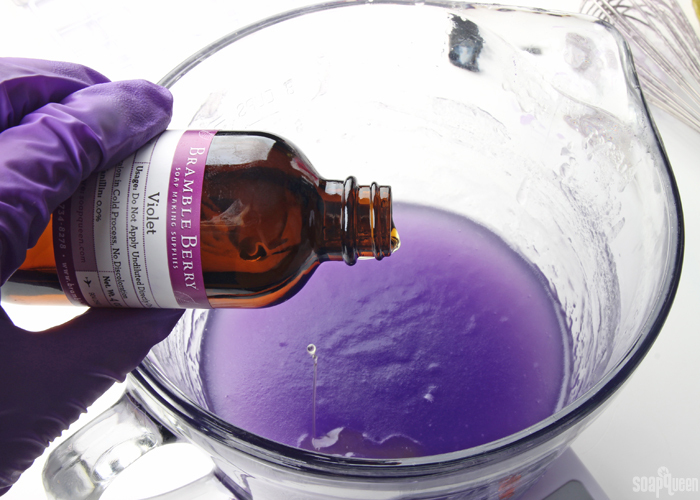 Continue to add drops of the Liquid Violet until you achieve a rich purple color. I used about 15 drops. Keep in mind when the sugar is added, the color will lighten. Add drops until you’re happy with the shade, and use the whisk to completely mix in. 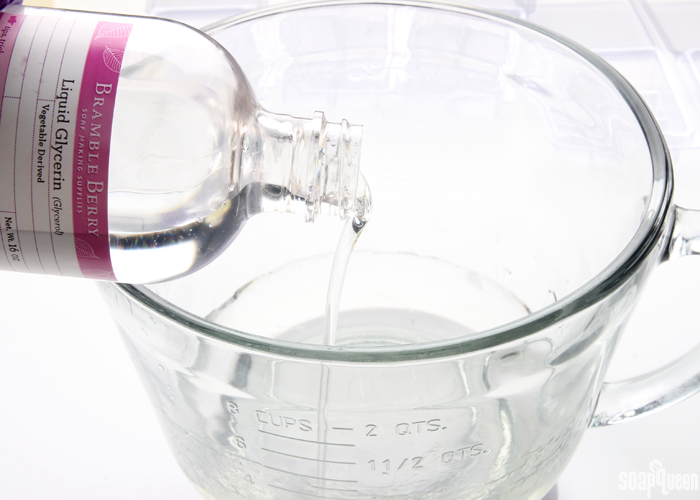 Add the Violet Fragrance Oil, and use the whisk to completely mix in. At this point, the mixture will have cooled. Once the sugar is added, the mixture will cool very quickly. To keep the mixture fluid and pourable after the sugar is mixed in, check the temperature of the mixture. Heat in the microwave using 10 second bursts, stirring between each burst, until the mixture is about 135 ° F. Be careful to not burn the mixture. 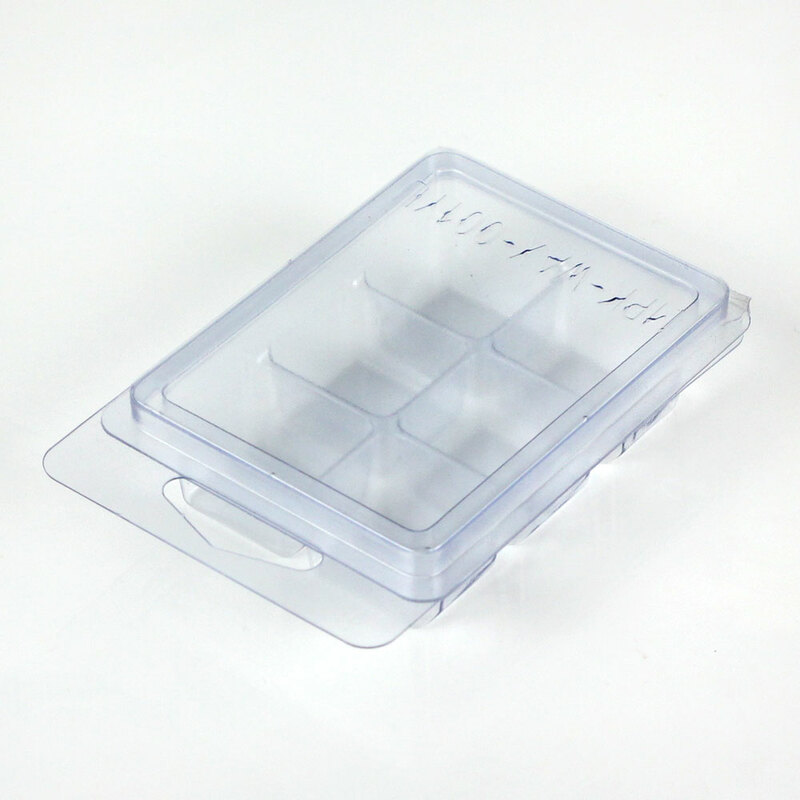 Open all the molds, and have them ready on the counter. Add the granulated sugar, and use a spatula to quickly stir in. 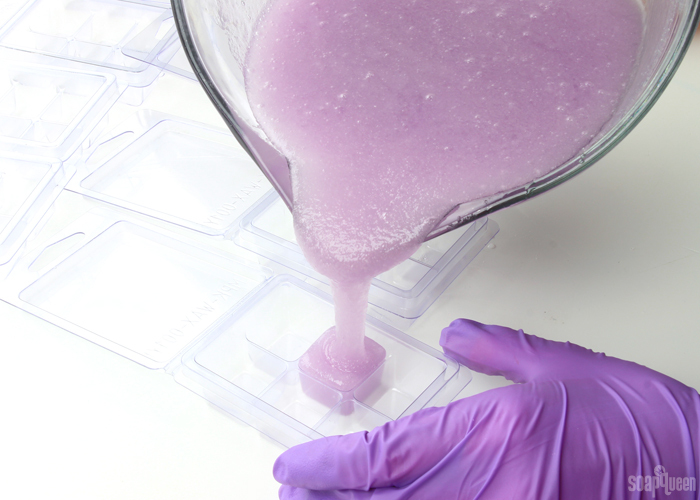 Pour the mixture into each Small Cubes Mold and Package. Allow them to cool and harden for several hours, up to overnight with the lid open. Once the cubes have fully cooled and hardened, use a knife to cut the cubes at the seam. Or, you can break off a cube once you’re ready to use. To use, wet hands and break apart the cube. Apply to the skin and scrub. The cube also creates a mild lather from the soap, leaving skin feeling clean yet moisturized. Store the cubes in a dry, cool place. Avoid them from coming in contact with water prior to use. Enjoy! Next Post: Cold Process Fall 2016 Soap Swap: Sign Up Now! i really loved your post, i just want to know how much is it going to last? i have to add some conservant or something? i definitely going to try this. i’m from Chile so i’m sorry if there is some misspelling. These scrubs will last 6 months to one year. 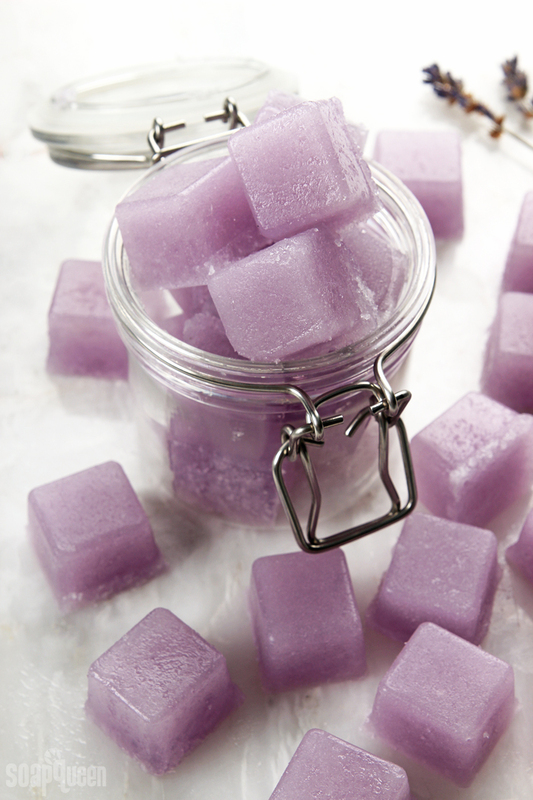 You don’t need to add a preservative because these cubes don’t have any water in them. I have a question. Followed a different recipe yesterday n while they held together nicely (honestly haven’t tried them yet so don’t want to comment but)….they are SO oily to the touch. Before I invest the products, are yours the same way? Bescause if the glycerin n the oil….do they practically slide right out if your dry hand? They are oily during the first couple days, but harden up after that. is it going to work with any other oil? or do i HAVE to use the same avocado oil? I just checked on my end and I’m able to see the recipe. Is it still blank for you? Do you think adding aloe liquid to this recipe will work? 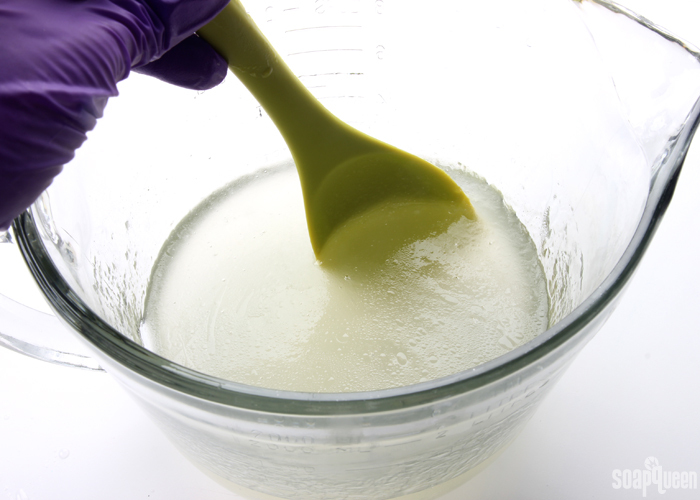 I want to use the aloe m&p base and I always add a teaspoon of aloe liquid to a lb when making soap. I don’t mind if the aloe makes them a little softer as it sounds like they are pretty hard to begin with. We haven’t given that a try but I think it would be OK. Try a small test batch first to see if the aloe liquid makes them too soft. If so, you can add less aloe liquid or glycerin for your larger batch. I made this recipe exactly as it said to do it. Am I suppose to feel something when rubbing it on my skin? It just feels like a bar. I don’t feel the sugar at all. Did I do something wrong? The cubes will feel pretty hard when you’re first using them. However, the more you use them the more sugar will be exposed and you’ll feel the scrubbiness. You can also break the cubes and scrub that way. Can I make them cube shape , without the soap base? No, without the soap the ingredients will be liquid like a traditional scrub. 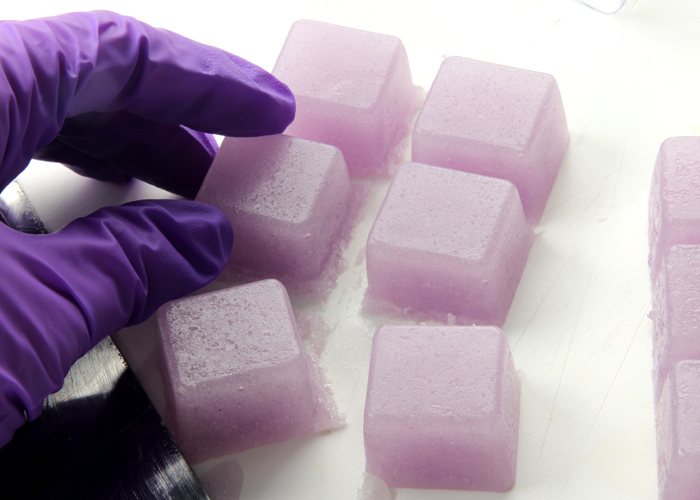 If you want to form the cube shapes, you’ll need solid melt and pour soap. I don’t have any M&P. What can I use in place for it?? Hi do these get glycerin dew in the clamshell packaging? If you live in a really humid climate they may form some glycerin dew. You can either wrap the individual pieces with plastic wrap and place them back in the container, or keep the containers in a cool, dry place with a fan or dehumidifer. Can you leave out the sweet almond oil? I accidentally ordered 16oz of glycerin and have no clue what to do with it and this is the only recipe I can find that uses it. I only make m&p so I don’t have any oils on hand. 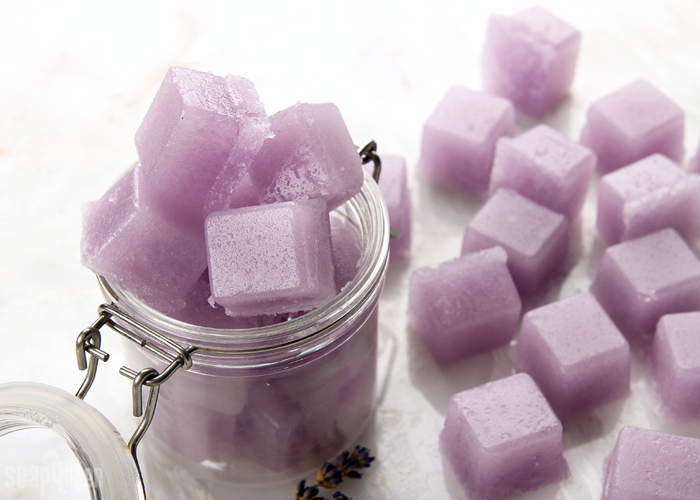 I bought the sugar scrub cube kit https://www.brambleberry.com/Sugar-Scrub-Cube-Kit-P6669.aspx, and made these and they were terrible. the cubes were hard and didn’t disolve well enough to even use as a scrub. I think the glycerin soap was the problem. the kit was a big disappointment. so this recipe will likely be the same since it’s the same. I’m sorry about that Minerva. Because they’re made with hard melt and pour, the cubes themselves will be pretty firm. It helps to press on them to break them up while you’re using it as shown in the picture above. That will make them a bit easier to scrub with. 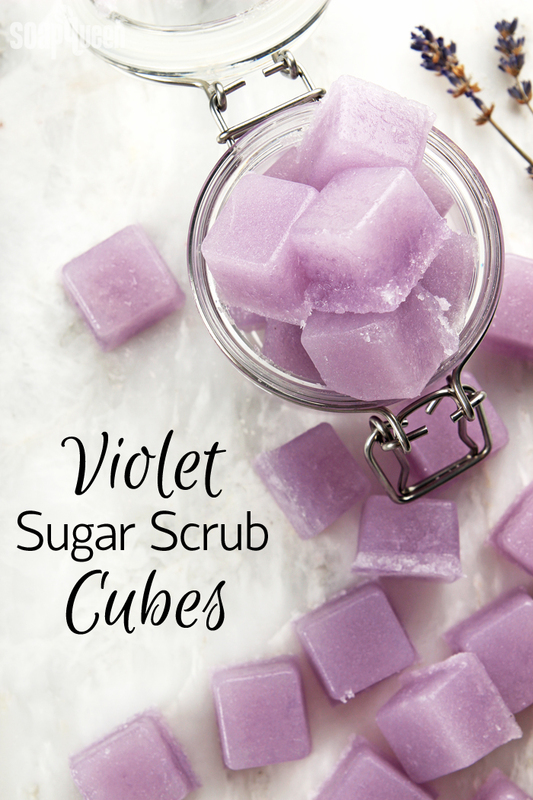 If you’re not a fan of the cubes, you may also like a traditional scrub. It’s easy to grab out of the jar and apply to the skin. Hi Kelsey, in addition to my salt question, what if I wanted to add your Bamboo exfoliant to add a little more scrub. Would that work? If so how would you suggest I add it to this recipe? can you make this a sugar and salt scrub? if so what type of salt and how much should I swap the sugar with? Hi, Kelsey — I’d like to make this recipe with Lavender EO instead of the fragrance oil. Can you recommend how much EO I should add? Thanks much! Hello, I’m very much looking forward to trying this recipe for Christmas gifts this year, was wondering goat’s milk melt and pour base would work okay, or if glycerin or shea mp base is preferred? I’m not entirely sure why that’s happening! I went and checked the cubes we have on hand and I didn’t notice any rubbery feeling. They feel firm to the touch and then break apart when squeezed. They won’t have a lot of lather because the extra sugar and oil weighs that down, but they shouldn’t be rubbery. I’m wondering if the sugar melted? If so, that could make the cubes feel rubbery or sort of like taffy. What temperatures were you using? I’m sorry for the delay, I was not notified that there was a remark made to my post, only saw it now when I came back to check. To be honest I’m not sure what the temp wasv when I mixed it all together, I melted the mp soap and I want to say it was about 120 degrees or so when it was all fully melted, I had to do about 10- 30 sec bursts in other for all of it to melt completely . When I mixed in the sugar it only took about 15 sec when it all started to solidify , so back into the microwave it went to get it to remelt. How do you keep it from solidifying so you don’t have to put it back in the microwave ? I do notice wit the mp, ad soon as its melted I have about a minute to add my color and fragrance and then pour it into the mold, it I’m not super fast at this, it starts to harden up again and back into the microwave it goes. I’m starting to think this might be an issue with the mp I’m buying from Michaels craft store. But when I made these after the mp was done melting I added the sugar and it immediately started to become solid and impossible to pour into the mold so I had to go back to the microwave and melt it all, this time with the sugar inside the mp till it was liquid like consistent so that I can pour it into the molds. Any advice ? From my experience with soap bases from Michael’s or Hobby Lobby, please avoid them because they are poor quality. I believe that you will have better luck if you buy soap bases from Brambleberry Soaps Inc.
Hi Patti! These cubes will be fairly hard after they’re made. They do have a solid texture. 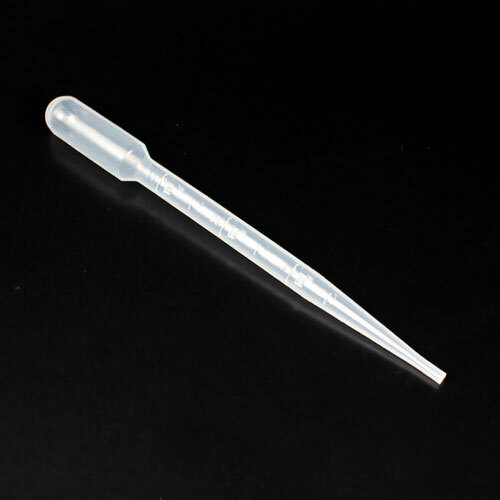 The glycerin helps them transfer to the skin more easily. Are they still washing and scrubbing the skin? If so, they should be just fine to use! Love this project! I have some LaBomb colors that I would like to use up…may I use those colorants in this project? Thanks Kelsey! I made these (finally) today and they turned out perfectly!!! And the La Bomb Colorant- Rosy Pink worked perfectly..I can’t wait to make more!!! If I wanted to use coconut oil in place of almond oil, would you suggest increasing the amount of glycerin? Thanks! I made these the other day and they are beautiful and felt great to use. I can’t wait to make this beautiful recipe! I love the “rainbow” theme this summer, I have to order some more violet FO. I also have a question about (Shea oil versus Shea butter) in lotion recipe. Is their a difference if you use Shea butter or Shea oil? Like would Shea oil be “oily-er” ? 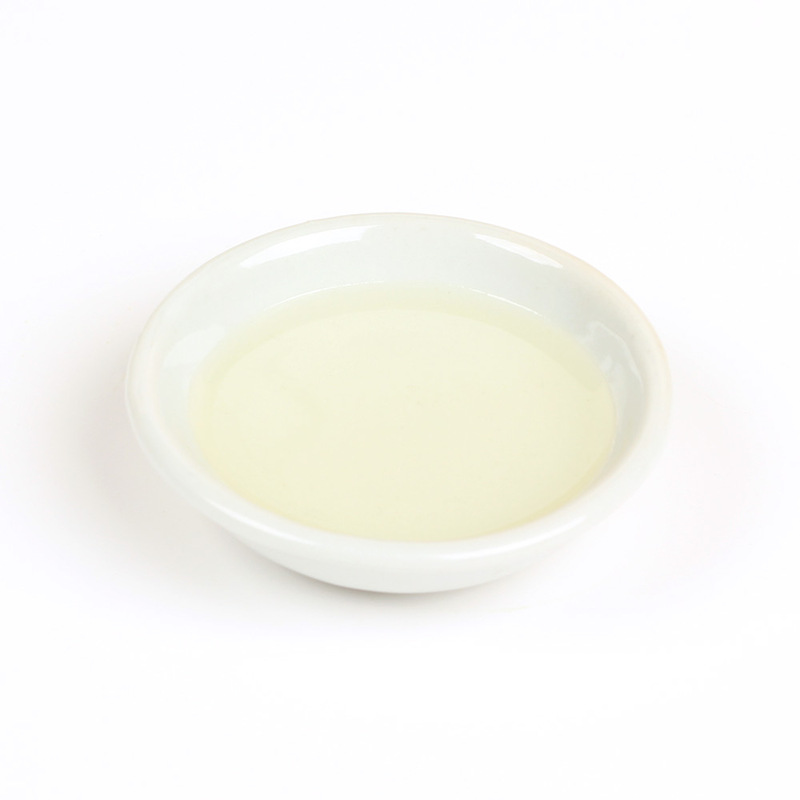 Shea oil in lotion will give the lotion a thinner consistency than shea butter. Because shea butter is solid at room temperature, it gives the recipe a thicker texture and feel. Both feel awesome in lotion. Which one you use is personal preference. I would recommend making a small test batch with both to see which one you like best! I love these! I can’t wait to make them with the glycerin in it. I love the Pumpkin and Brown Sugar scent for these. My family loved them as gifts. I think I will try and sell some. I also made them with Hello Sweet Thang and they were awesome! I have just enough of both scents to make these!!! Thank you for the new recipe!!! hello I was wondering why I don’t get a email or something saying my order number but I don’t get anything? is this a normal process? I spent over $50? Thank You. Do we need to add any preservative for sugar? What is the shelf life of this soap? Can you replace the almond oil with another oil? I try not to use almond oil , to many people have nut allergies. What would you suggest? I have a slightly bigger mold which I think will work well but it might mean that the cubes will be bigger so will not be a one time use. Will this be ok or do I run the risk of them going bad if I use them two or three times? I had some bigger cubes too, so I would just break off a piece and use it. In my experience they were ok being left in the shower. Not sitting in water of course. Be aware that they might attract ants if you leave it uncovered.